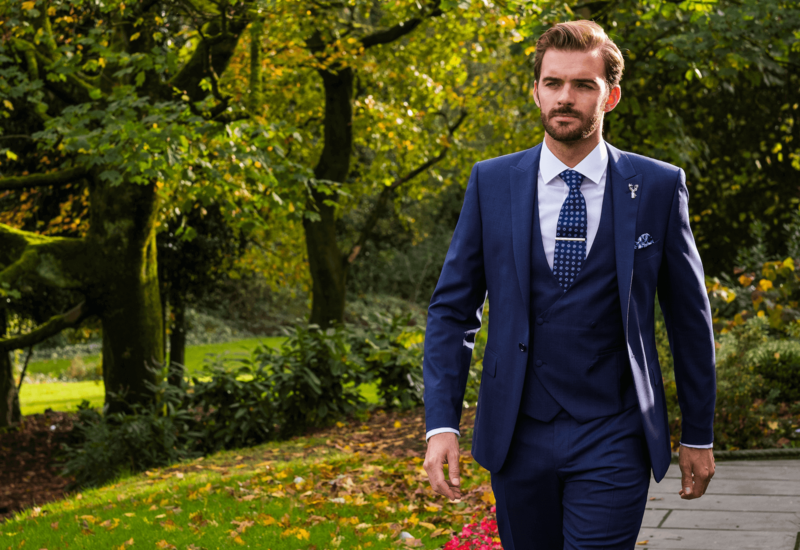 If you’re wedding is approaching and you’re wondering where to start with your suits, follow our simple grooms guide to make sure you get it right. With so much focus on the dress, the venue and the flowers, choosing the grooms suits can perhaps get forgotten in the wedding planning process! It may appear a simple task but there’s a lot of things to consider, plus the wedding suits will be a major feature in your pictures so it’s important to get it right! At Whitfield & Ward we’ve helped thousands of couples put together their dream wedding suit. For tips on how to create the perfect suit for your big day, read on. In our view it’s never too early to start planning your wedding suits and we’re amazed that many wedding calendars suggest this should be done only 3 months before the wedding! To ensure that we deliver an amazing personal service, we limit the number of weddings we cater for each weekend. This means that key dates fill up fast, so we recommend coming in to see us as soon as possible to avoid disappointment. If you’re planning on hiring your wedding suits, we’d suggest starting the process 12 to 6 months before your wedding date. To learn more about the process of hiring a wedding suit, read here. For those of you planning to buy your suit, we’d suggest that you start this as early as possible. 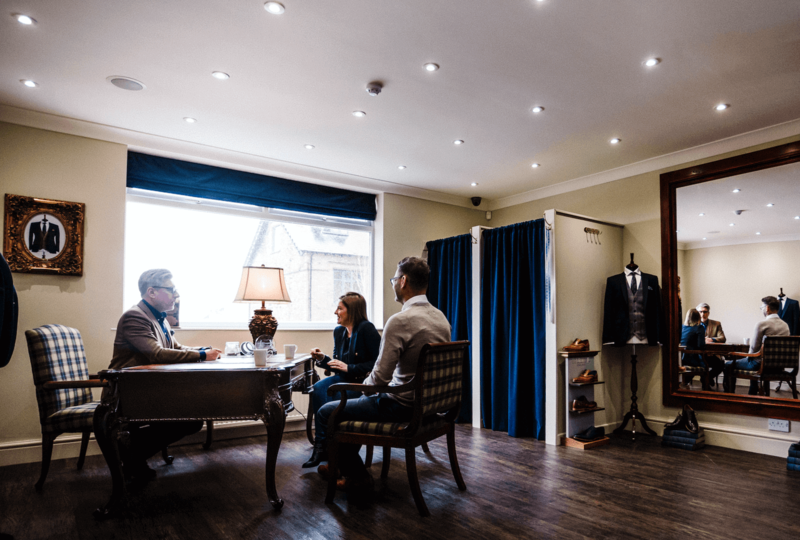 A suit can be designed and delivered in 4 months, but we’d advise having your first appointment at least 6 months before so you can fully enjoy the experience. To learn more about our the process of designing a bespoke wedding suit, read here. Make sure you do your research. Take a look at Pinterest, Facebook and Instagram – they are great places to start when thinking about your wedding suit. Also, don’t forget to check out your venue and photographers on social media for inspiration. During the summer months, we’d advise a lightweight lounge, morning or dinner suit. Consider wearing a waistcoat too, as it will give you a more distinguished look if you and your groomsmen need to take off your jackets. Your suits need to reflect the formality of your setting. Rustic barns work really well with more relaxed suit styles with touches of tweed and checks, whilst stately country homes and city hotels are the perfect backdrop for formal morning and dinner suits. Look at wedding pictures from your venue to get ideas for what works well in that setting. Or check out our Pinterest boards here. The suit style needs to tie in with your wedding theme but our advice is not to get too caught up with it. In our view the groom doesn’t necessarily need to match the brides or bridemaids dresses. After all, it’s important for him to standout out too and pink just may not be his colour! 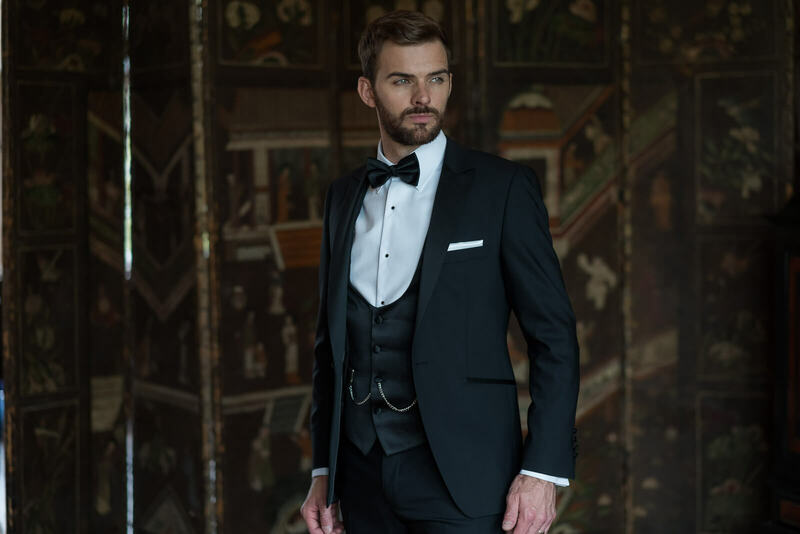 At Whitfield & Ward, we believe that the groom should have a stand out look, because while it’s obvious who the bride is, in a sea of suits it can be difficult to distinguish the groom. How much you want to standout will depend on your personality. To make a statement, opt for a suit in a different style, cut or colour to the rest of the groomsmen. If you’re looking for something more subtle, go for a different tie or waistcoat. Check our Pinterest board for some of our favourite waistcoats. A great fitting suit will boost your confidence on what is one of the most important days of your life. At Whitfield and Ward, we’ll guide you every step of the way, advising on the styles and colours that complement your build and flatter your skin tone. Our role is to listen your ideas, advise you where necessary and work with you to create a wedding look that makes you feel amazing! Our team of stylists will be on hand to create a personalised look like no other from our exclusive range of waistcoats, ties and pocket squares. We’ll work with you to create a suit style that is contemporary yet classic. Remember, this season’s latest colours or cuts may not look so great when you look back at your pictures in twenty years! If you still haven’t found your dream suit or need some help with what to wear on your big day get in touch with us, so we can help you explore some options. Give us a call on 01625 536 545 and we’ll handle the rest.